Enjoying 2018 Silver Needles, from Korakundah in Southern India. Relayed to me is this was an uncommon production of only 90kgs. The tender first flush silver buds produce a delicate sweet champagne like liquor, with background notes of black tea. Paired with a tea set from my Swiss great grandparents, sold by a company they owned in Luzern, Buchecker & Co. and Kiyomizu-ware glazed teapot. Sounds fantastic. How did you brew it? The color of that silver needle is pretty dark. I'm assuming it's because they're using tea bushes that are typically used for Darjeeling... is this one of those new experimental Indian teas? It may be the way I steeped it, not sure. The flavor was light and vibrant. It is organic 1st flush 2018. Salvador is all sold out for 2018 on this particular one. Korakunda’s Silver Needles is Assamica variety ( a subspecies of Camellia Sinensis) and the way they dry the young buds is a little different from the standard Chinese method. The Korakundah is hot air dried and oven fixed, this makes the tea liquor darker than most Chinese Silver Needles, which is mostly sun dried, although some Chinese also hot air dry but this is less common. In neither case are the young buds pan fried. I had a small amount left over so am enjoying it as I write this. It is indeed the same color posted in my picture above, the wet leaf is super aromatic and liquor has complex notes of muscatel white grapes, sweet rock fruit, and it sort of pops in the mouth. Next year I’ll for sure try and get more. Yeah, not just whites, I think most tea types in India are primarily factory processed, while there is often significant natural & hand processing for Chinese teas. Clearly this makes for a noticeable difference in the end product. Having Song Tea's 2018 Silver Needle. I'm not enjoying it very much, it's too dry with not enough "juice" or flavor to give. They actually recommend brewing it with boiling water for a minute and I didn't enjoy it as it was too astringent but it did give some floral. I tried it at 185F for 4 mins (my preferred way of having Silver Needle) and it gave some sweetness but the lack of overall flavor became more apparent. Having Junshan Yinzhen from Hojo. It has a nice clarity to the taste which I appreciate given the price point, though it's also been coming with astringency which I'm not sure if it's due to it being yellow tea or my brewing. Considering I had silver needle right before this which I brewed twice as long and it didn't have the same effect, the difference is noticeable. My friend says it tastes like asparagus, I agree slightly, to me it tastes more like if a wet cotton shirt were left drying in the sun and you smelled it after it dried. I've only tried a handful of teas that were labelled as yellow teas, and one was delightful, delicate, floral, sweet, but with a bit more edge than usual in a white tea; and the others were very difficult teas to enjoy, because most infusions were quite astringent or frankly bitter and only occasionally did I really enjoy more than one infusions from them. I played with concentration, temperature, brewing time, and they were just tough to get right. The question in my mind always has been whether the one yellow tea I liked was an anomaly--misidentified as a yellow tea, even--or if the others I got were just not very good quality and hence harsh. Since your yellow tea came from Hojo, it seems safe to assume it is a quality representative of the genre, and strongly suggests that the one mellow yellow I met was the anomaly, not the others. Today I'm drinking Silver Needle from Wuyi Origin. This silver needle is better than Song Tea's. It's missing a third dimension for sure but at least it's closer. Decent enough to be a tea I drink at work. It tastes a bit like dried white mulberries. There appear to be a lot less trichomes in this tea than the one from Wuyi Origin, which is likely a contributing factor as to why the latter tastes better. I am drinking a 2017 Avongrove Spring Euphoria – First Flush White. Quite delicious, definitely has those delicate nutty and floral notes of a white as opposed to traditionally processed FF Darjeeling. Perhaps not the absolute best FF White I've had, Vahdam's 2017 Arya Pearl and Okayti Silver Needle were stunning. But this is quite good, and was a relative bargain at $23/100g as opposed to the $50+/100g good FF whites tend to fetch. And it's better than most Fujian or Yunnan white teas I've had lately, excepting perhaps one of Hojo's. Not my pic, but its accurate. Thus far I have not bought much 2018 tea, working my way thru the remaining 3.5 kg I have from 2017, which should last me until March 2019. 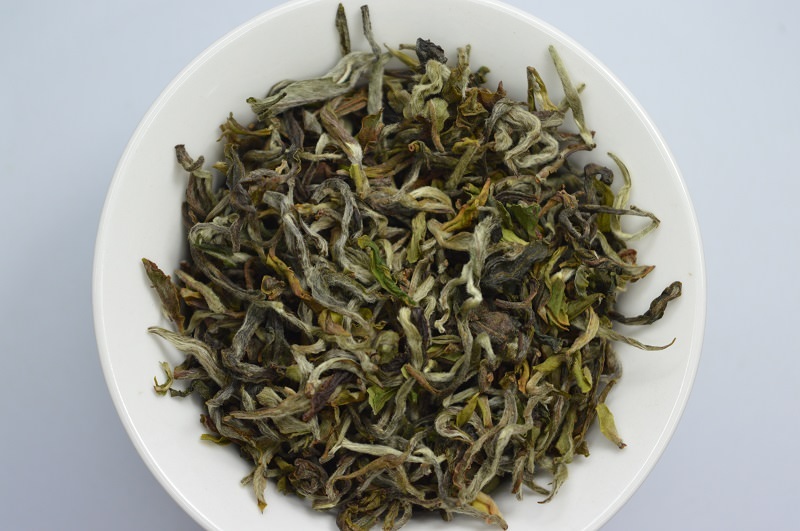 So I'll buy some 2018 teas this Winter, and try to time it so I can do sampling and some 500 to 1000g bulk ordering in Spring - Summer 2019.
i've noticed white bingcha seems more and more popular. especially in gift shops. i have had a few of them and was not impressed, but this one is pretty good. it is a lot like oriental beauty with a fresh medjool date note. i got the idea to grab one from the fridge after tasting the tea.